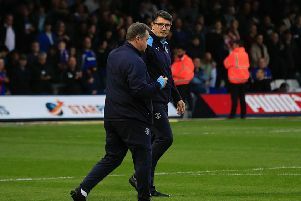 Luton boss Mick Harford is well aware that today’s opponents Plymouth Argyle will be desperate to put right their awful showing at Kenilworth Road earlier in the season. Back in November, James Collins scored a hat-trick as the Hatters romped into a 4-0 half time lead, before eventually running out 5-1 winners. The Pilgrims have picked up dramatically themselves since then though, unbeaten in five on home soil and winning six from 10, to climb up to 14th place in the table. Harford said: “They’ll be looking to get one over on us on Saturday. “Obviously we played well against them, scored five goals and James got three. "Hopefully he’ll do it again, but they’ll be looking to right the wrongs from their visit to Kenilworth Road. “They’re on a bit of form Plymouth, I think they’ve lost two of their last 10 games, they’ve got good home form, so it’s going to be a big test. “The team that’s at the top of the league are coming to play them and people like to beat the top of the table team. “So it’s going to be a massive test for us, we know that. “They’ve got some very good individual players, the likes of (Graham) Carey, (Ruben) Lameiras, they have a good set up in their team and it’s been proven again. Striker Collins, who netted a treble that day, saying: "That game’s gone now, we beat them 5-1 at home, but that will also mean it’s an even tougher game this weekend as they’ll be after revenge. "We’re away from home as well and it’s a long journey, but we won’t take it lightly. "We know what task is in front of us, we’re going to go into the game full of confidence and we know we need that three points." With the finishing line in sight for the Hatters, Collins doesn't think Luton need to alter their methods with the goal of the Championship in sight. He added: "Not really, we haven’t been changing too much. "We stick to our principles, we stick to our gameplan and we know what we have to do. "We know what we need to do to win games, but when you are at the top of the table, people do want to shoot you down. "I think since we have been top we’ve relished that and that’s evidence in our form."